WHAT THE BOOK IS ABOUT Dr Clyde Hughes shares with you what he has learnt over more than 30 years working as a healer, medium, dowser, space clearer and exorcist. Clyde will show you how to Dowse form start to finish. Select and programme your divining instruments. Find energy blocks in your body. Check crystals for negative vibrations and how to clear them. Check your beliefs ..find out what your subconscious mind is thinking . Check your aura and Chakras for blocks or damage. Check yourself for curses and vows that can bring poverty bad luck and illness. How to set a crystal grid. Find out how to locate your guardian angel and how to do smudging and space clearing. The pair of Dowsing L Rods are brass with a rotating disc on the handles. All rods are blessed and have their energy cleared ready for then to be programmed. 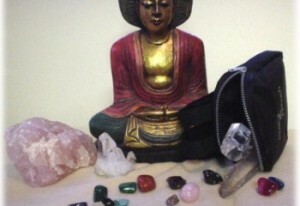 Crystals are widely used in healing. You may need to carry your crystals with you or want to store them safely. 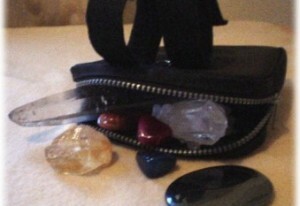 Our Crystal Pouch is ideal for carrying a number of crystals safely and securely. The Pouch is also useful for carrying other valuables or essentials such as keys, mobile phones, money, etc..
Each pouch is made of a tough waterproof material and has a secure zip. 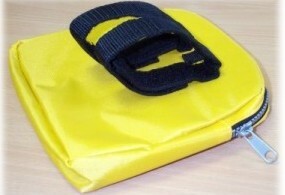 The back of the pouch has a patented fixing allowing the user to either fix it temporarily using the velcro straps or permanently using the tough ties supplied. 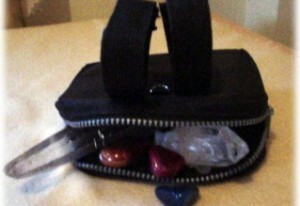 If you would like to order a Crystal Pouch please email me. Price is £6.99. Discounts are available for bulk orders.